Cook green beans in large pot of boiling salted water until just crisp-tender, about 5 minutes. Drain beans and rinse under cold water. Drain. Pat dry with paper towels. Wrap in kitchen towels and place in plastic bag. Chill until cold, at least 1 hour and up to 1 day. Place beans, mixed greens and onion in large bowl. Toss with enough dressing to coat. Season with salt and pepper. Garnish with sliced radishes, if desired. This is a great main-dish salad, with tender tuna and crunchy, spicy radishes. Serve it on top of lettuce with crusty bread on the side for a substantial no-cook meal. Two 6-ounce cans tuna (preferably imported and packed in olive oil), drained and coarsely mashed with a fork. 1 medium head romaine lettuce, washed, dried, and torn into bite-size pieces. Whisk together the lemon juice, olive oil, and salt in a small bowl. Combine the radishes, parsley, scallions, olives, and tuna in a medium-size bowl. Pour the dressing over the salad and toss to coat. Divide the lettuce leaves among 4 plates. Top with the tuna salad. Serve immediately. Sangria lightened with sparkling water makes a festive spritzer to go with this dinner. Mix broth, soy sauce and cornstarch in small bowl. Heat 1 1/2 teaspoons oil in large nonstick skillet over high heat. Add half of steak and half of juices from dish and sauté until steak is brown, about 1 minute. Transfer mixture to plate. Repeat with 1 1/2 teaspoons oil, steak and juices. Return all steak and juices skillet. Add green onions and radishes and sauté 1 minute. Stir broth mixture, add to skillet and sauté just until steak is cooked through and sauce thickens, about 4 minutes. Transfer to plates and serve. In a small bowl with a fork combine well the butter, the cream cheese, the chives, the zest, the Tabasco, and salt to taste and transfer the mixture to a pastry bag fitted with a medium-sized open-star tip. Arrange the radishes, cut sides up, on a platter, put a parsley leaf on each radish half, and pipe the chive butter onto it. Market tip: To make this dish even faster, buy sugar snap peas with the strings already removed; they’re sold in 8-ounce packages at some supermarkets. Cook peas in a saucepan of boiling salted water just until they turn a brighter shade of green, about 30 seconds. Drain in a colander and rinse under cold water to stop cooking. 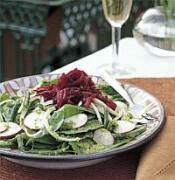 Cut halved cucumber and radishes crosswise into 1/4-inch-thick slices. Toss peas, cucumber, radishes, and sesame seeds with vinegars and season with salt and pepper. If you don’t have seasoned rice vinegar in your cupboard, you can substitute unseasoned and add 1/4 teaspoon salt and 1 1/2 teaspoons sugar. 1. In a bowl, whisk together 1/4 cup olive oil, vinegar, mustard, salt, pepper and sugar substitute; set aside. 2. Heat oven to warm setting. Heat remaining tablespoon oil in a large nonstick skillet over medium heat. Sprinkle chicken with salt. Cook 5 minutes per side until golden brown and cooked through. Thinly slice chicken; place in oven to keep warm. 3. In same skillet, cook pepper about 5 minutes, until soft. Add garlic and cook 1 minute more. Stir in radishes and green onions. Cook 5 minutes, until radishes are crisp-tender. Mix in lettuce and chicken. Heat through until lettuce wilts slightly. 4. Transfer to a bowl; toss with dressing until evenly coated. Serve immediately. Melt butter in a skillet. Add oil. (This helps prevent butter from burning. Alternatively, you can use Plugrá – a more heat stable butter – see our product suggestions page for more info.) Add sliced mushrooms and sauté for 2 minutes. Add sherry and cook 1 minute more. Mix together sour cream, grated cheese, salt, and pepper and add to mushrooms. Cook over low flame until sour cream has warmed thoroughly (do not boil.) Add additional grated cheese if desired. Serve while warm. Arrange hot cooked broccoli in shallow 1 1/2 quart pan or broiler proof serving dish. In small bowl with mixer at high speed, beat egg whites and salt until stiff peaks form. Fold in cheese and mayonnaise; spoon evenly over broccoli. Broil six inches from source of heat four minutes or until golden brown. Cut bacon into 1″ pieces. Place in large frying pan and cook until ready to turn. Add butter and onion and cook till medium brown. Add cut cabbage and add bay leaf if using. Add enough water to cover (1/4 cup at a time.) Cover and allow to steam, stirring often, and adding water as needed to help loosen the brown bits in the pan. Cook 15-20 minutes (it will cook down quite a bit in volume.) Taste to check for desired tenderness. When almost done, add vinegar, stir, and heat an additional 5 minutes. Sprinkle with coarse black pepper just before serving if desired. The green beans and the poblano chiles in the salad dressing may be the only ingredients that are indigenous to Mexico, but the colorful combination of vegetables, with their contrasting textures, results in a fitting accompaniment to any Mexican dinner. Char chiles directly over gas flame or in broiler until blackened on all sides. Enclose in paper bag 10 minutes. Peel, seed, and coarsely chop chiles. Combine chiles, orange juice, oil, vinegar, and garlic in blender. Blend until mixture is smooth and thick. Season dressing to taste with salt and pepper. Cover; chill until dressing is cold, at least 1 hour and up to 1 day. Preheat oven to 400°F. Wrap each beet tightly in foil; place directly on oven rack. Roast beets until tender when pierced with knife, about 50 minutes. Unwrap beets and cool completely, then peel. Coarsely grate beets into medium bowl. Toss with lime juice. Season to taste with salt and pepper. Cover and let stand at room temperature at least 1 hour. Cook green beans in large pot of boiling salted water until crisp-tender, about 3 minutes. Drain; transfer to large bowl of ice water to cool. Drain again and pat dry. Toss green beans, spinach, onion, and radishes in large bowl with enough dressing to coat. Season with salt and pepper. Divide salad among plates; top with beets. Stir together cream cheese, herbs, zest, lemon juice, table salt, and cayenne. Slice 32 (1/8-inch-thick) rounds from cucumber with slicer. Trim bottoms from radishes, then slice into 32 (1/16-inch-thick) rounds with slicer. Top each cucumber slice with a radish slice and 1/2 teaspoon herbed cream cheese. Sprinkle with coarse sea salt and serve immediately. *Available at Asian markets and cookware shops. Preheat oven to 375°F. Cook cauliflower in microwave or on stovetop until it is VERY done – fall-apart fork tender. Drain well and mix cauliflower with all other ingredients except cream in food processor or with a powerful mixer (hand or stand). Mixing with mixer will give “lumpier” results than a food processor, but some people feel the lumps make it seem even more like mashed potatoes. Add cream slowly and mix again. Spray an ovenproof dish with cooking spray and put mixture in. Add pats of extra butter or margarine on top if you like an extra buttery potato, and a bit of paprika sprinkled on top adds nice color as well. Bake 15 – 20 minutes until hot. 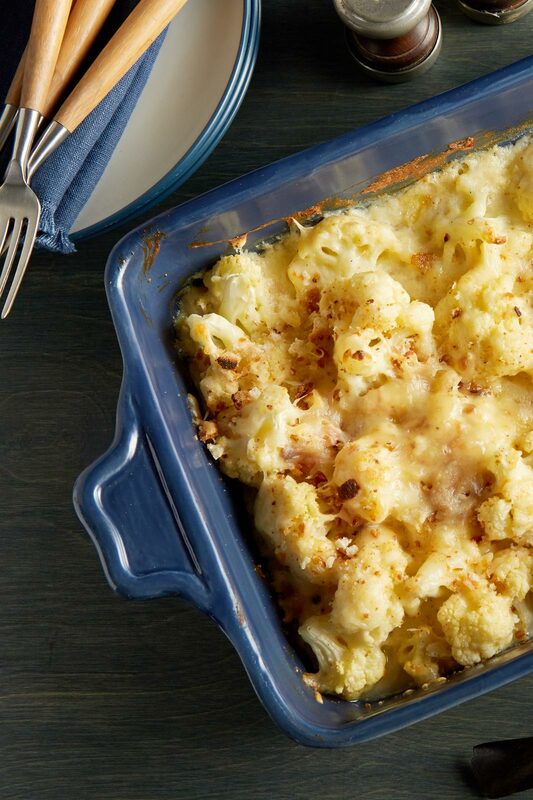 ALTERNATE VARIATIONS: Instead of using cauliflower, you can also use Turnips! For this method, peel and dice turnips to very small squares and boil till extremely tender (just short of mush!). Use the method above, or skip the oven step if you prefer since they hold their shape better than cauliflower. They have a very potato taste also – you would not guess these started their lives as turnips! For a REALLY rich Mock Mashed Potato, add 2 oz Philadelphia Cream Cheese (softened) before adding to the mixer/food processor. Adjust carbs accordingly. Turnips have slightly LESS carbs than cauliflower (and more fiber) so there’s no worry of over-carbing. Peel the turnips with a vegetable peeler, slice and cut into 2 1/2-by-1/2-inch sticks. Pour 1/2 cup heavy cream into a large bowl and place the turnip sticks into the cream. Fill bowl with cold water until the turnips are completely covered. Add 1 teaspoon Splenda. Swirl a bit to mix and allow to sit in cream mixture for 10-15 minutes. (This cream-soaking step removes the “bite” flavor of the turnips, leaving them with a milder, more potato-like flavor.) Rinse in colander with cool water and pat dry. Combine turnip sticks with the nutmeg, pepper, sea salt and Parmesan cheese in a large plastic (Ziploc-type) bag. Seal the bag and shake well to coat the turnip sticks. Spray 2 large baking sheets lightly with the olive oil spray. Spread the turnips in a single layer on the sheets and spray again with the olive oil. Bake in a preheated 425°F oven for 15 minutes. Turn the fries over and continue baking for 15 minutes, until the fries are tender and golden in color. Serve hot with a sprinkle of lime juice. Sauté onions and mushrooms in butter until tender. Add zucchini and cook just until tender – don’t overcook! Sprinkle with seasoning; stir to mix well and, while still in frying pan, top with mozzarella cheese. When cheese is melted, serve immediately! This is a superb side-dish to steaks. Preheat oven to 350°F. Open frozen cauliflower bags one at a time into a collander and run cool water over each to separate the pieces and slightly thaw, but don’t use warm water. Spray large casserole dish with Pam (or butter it well) and layer 1/2 (1 bag’s contents) of cauliflower across bottom of dish. Season with salt and pepper; then layer with bits of onion, thinly sliced “pats” of butter, and 1/2 of cheddar cheese. Repeat. Pour cream over top and place dish in oven. If dish is very full, put a cookie sheet under it to prevent bubble-over in oven. Bake 45 minutes. 10 min before completion, add crumbled bacon if you opt to. Bubbly and delicious – this will cure your craving for scalloped potatoes!